The Englishmen are the new World Number One. Their ruthless, convincing and highly competing display of cricket has taken them to the top of the tables with their path seemingly more convincing than the ones taken by the Indians not too long ago. James Anderson’s devastating spell to take four top order wickets was good enough to hand England the momentum, and Dhoni his first series loss as captain. England has evolved into a unit which is greater than the sum of its parts. And most importantly, every member of the playing XI seems to have had a clear role defined for him. How well they’ve executed it! The margins of victory over these three tests, if browsed through a decade from now, will contain no evidence to showcase that the visitors came into the tour as World Number One. As the Indians found themselves a beset under a swarm of criticism, during and after the course of events on the third day of the Edgbaston Test, it seemed as though it was only going to be a matter of time before England ascended the throne of Test Cricket. Signs of optimism were scarce and scattered across minds that hoped for a repeat of Napier in 2009, where India battled through seven sessions to save the Test. Considering the visitors’ current run of form, this feat seemed more unlikely than possible. The theory’s correctness was soon proved as Napier’s hero Gambhir departed to the first ball he faced, during the second over of the day, as he, quite literally, guided an Anderson delivery in to the hands of Swann at second slip. The optimist’s ride stumbled across a roadblock, while the red cherry in Anderson’s hand possessed movement that would have easily pierced through every point in the trajectory of a simple pendulum with relatively large amplitudes. It makes no sense to conduct a post-mortem over the dismissals that followed, barring two – one strange, and another unfortunate. 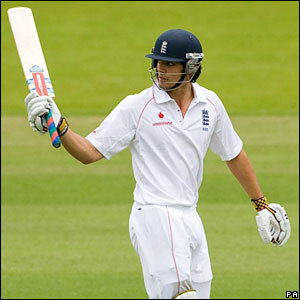 If the current economic downturn forces global corporations to attempt running their business with shoestring budgets, Dravid’s shoestring was the cause for his misery as he, for reasons unknown, walked after thinking that he nicked a James Anderson delivery to Matt Prior when in reality, it was the contact between his bat and his shoe laces. It is perplexing to try and understand what might have gone through Dravid’s mind at that time. Some things are best left unsaid. Tendulkar, on the other hand, was caught off-guard at the non striker’s end when MS Dhoni played a shot that reflected off Swann’s hands and crashed into the stumps at the other end. His dismissal, followed by the eventual plummet to defeat pretty much summarized the Indian summer. Having not managed to cross Man-of-the-Match Cook’s individual score as a team in either innings, Dhoni’s performance with the bat this test, inconsequential as it may seem remains the solitary positive. This victory presents an excellent opportunity for England to throw debuts to their much awaited young prospects – something that the “English Cricket relies on Foreign Imports” community might keen to witness. At the same time, England might look to go for the kill and target a 4-0 whitewash at The Oval. From the perspective of an Indian fan, there could still a breathtaking cynicism to this prospect, but this isn’t a case which is as unreasonable as it might have sounded a month ago. Three tests into this dreadful series, the question, surely for the Indians will revolve around how much worse it can get. Their display, thus far, has bordered disreputable incompetence. Excuses can, and surely will, fluctuate between injuries and overload, but what will remain imprinted are the results, never the reasons. For the British fan, this is the start of a new era. Let him cherish it for as long as it lasts, and if England continue to play the way they did this series, this is bound to be a long spanning tenure at the top. India’s biggest gain of this series might well be Sourav Ganguly in the commentary box. He is extremely balanced in his views and might well be the voice India needs in the media space as it turns to a new set of players to take over the reigns from the ageing superstars in the next year. England’s first target is to ensure that they keep India down and win the series 4-0. I’m hoping to see James Taylor make his debut at The Oval. Would be a refreshing change to this series – at least from a cricketing groundwork perspective. Yup, and we’ve come to a stage where “match-changing moment” are likely to be few in number, looking at the way we played in Edgbaston. I’ll be happy if we avoid a 4-0 drubbing. It is already way too embarrassing.